In order to encourage widow re-marriage and inter-caste marriage in the state, Social, Justice, Empowerment and Welfare Department awarded cash incentives to nine couples of the state. Minister SJE&WD Tulsi Devi Rai handed over the cash incentives to the beneficiaries in a special function held at the office on Thursday. A couple from Namcheybong ward, East Sikkim, Purnima Rai and Kishor Subba received cash incentive award on widow remarriage scheme. The award is given by the department encouraging remarriage of widows in order to raise their social status and ensure social security. Eight other couples also received cash incentives of Rs. 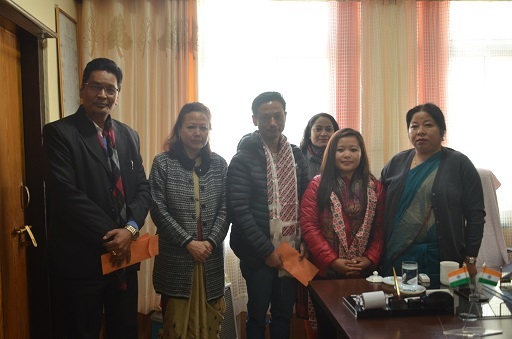 30,000 each (one time grant) under grant of incentive to couple of inter caste marriage namely Mannu Chettri from Ravangla, South Sikkim, Kamala Chettri from Sadam, South Sikkim, Ongmu Lepcha from Uttarey, West Sikkim, Dewki Tamang from Upper Yangyang, South Sikkim, Geeta Rai from Mangshila, North Sikkim, Mamata Manger from Rhenock, East Sikkim, BishnuPradhan from Melli, South Sikkim and Dil Kumari Sarki from Bikmat, South Sikkim. Minister, Rai congratulated all the couples for getting married and availing these schemes from the Department. She said that because of the directives from Chief Minister Pawan Chamling every individual is deserving of a secure social security and thus schemes like this help in improving the harmony of the state. She also handed grant aid to SAATHI (NGO). Additional Secretary, K B Pradhan informed that under Ministry of Social Justice and Empowerment, Dr Ambedkar Scheme for Social Integration through Inter-Caste Marriages, incentive of Rs. 5 lakh will be given to inter-caste couples and to avail this benefit of the scheme, the proposal should be recommended by Member of Parliament, Member of Legislative Assembly or District Collector within one year of their marriage.